Dr. Kaminester in North Palm Beach treats and “cures” skin cancer every day of the week! This is important, since skin cancer is the most common form of cancer in the United States. It involves abnormal growths that can appear anywhere on the body, but most frequently on sun-exposed skin. There are more than a million new cases of skin cancer in the US each year. Although most cases of skin cancer can be successfully treated, over ten thousand Americans die of skin cancer every year. Thus, it is very important to keep our skin safe and healthy and try to prevent this sometimes fatal and often disfiguring disease. 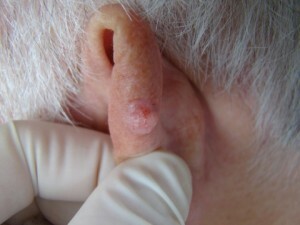 Squamous cell carcinoma affects the squamous cells, which are just below the outer surface of the skin and serve as the inner lining the growths are usually scaly and red and, if left alone, get larger, may bleed or ulcerate and become painful. Basal cell carcinoma affects the basal cells, which lay under the squamous cells and produce new skin cells. Basal cell carcinomas may take different forms and shapes, from smooth pink nodules to eroded skin colored areas to a hardly noticeable, scar-like appearance. When small, BCCs are easy to remove. When larger they can actually destroy a nose, ear or a good portion of the face! Melanoma is the most serious form of skin cancer and affects the melanocytes, the pigment cells which produce melanin. 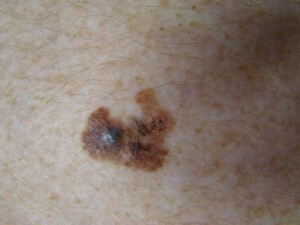 See the section on melanoma on this website for more information on melanoma. 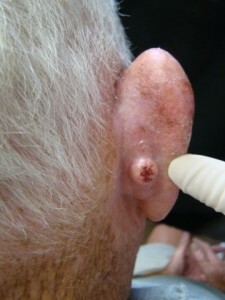 It is very common for Dr. Kaminester to point out to patients that they have a skin cancer they did not even know about. Skin cancers are very common in South Florida; the importance of recognizing skin cancers and removing them in the simplest and most effective way is always in Dr. Kaminester’s mind, especially since he removes dozens of them every day. He has written articles published in major journals on how to recognize and treat skin cancers, especially the two most common non-melanoma skin cancers, basal cell carcinoma (BCC) and squamous cell carcinomas. (SCC) Sometimes the opposite is true, and Dr. Kaminester can reassure the patient that the worrisome black growth they thought might kill them was a benign growth and not life threatening at all. Dr. Kaminester sees a number of patients who come to him for a second opinion on how to treat the skin cancer. While Mohs surgery is often the best choice for large dangerous skin cancers on the face, most skin cancers, especially non-facial, can be removed through simpler, less painful and less expensive methods, often with equally good or better cosmetic results. Informed patients and many insurance companies know that there is an over-utilization of Mohs surgery. Dr. Kaminester always discusses the different treatment options for every skin cancer, including radiation therapy and plastic surgery, although most skin cancers he sees are removed right in his office at the time of the visit. Patients are always invited to have a copy of their pathology report, which confirms the malignant nature of the lesion and that it was completely excised.